Danbury’s Noah Meeks fires a pitch against Darien during the first round of the Class LL state tournament Tuesday at Darien High School. Danbury defeated Darien 7-3. 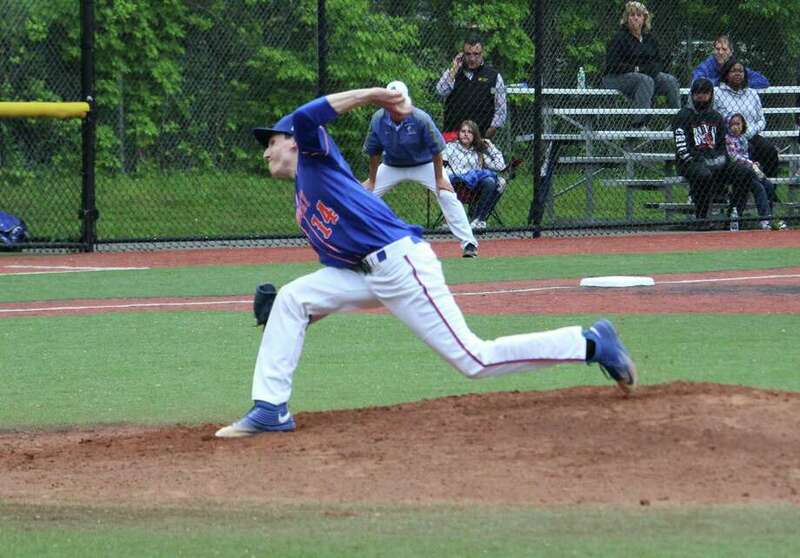 DARIEN — The Danbury baseball team picked a fine time for its most productive inning of the year. Trailing by two in the top of the sixth, the No. 20 Hatters exploded for six runs and went on to defeat 13th-ranked Darien 7-3 in the first round of the Class LL tournament Tuesday in Darien. Danbury will face No. 4 New Milford on the road Wednesday. Mike Halas contributed the keynote in the sixth with an RBI triple and Javon Hernandez had a two-out RBI single to put the exclamation point on the outburst. Danbury starter Noah Meeks allowed nine hits, but buckled down when he needed to, holding the potent Darien lineup at bay. Meeks was rewarded by the Hatters offense for his hard work. Peter Marren hit a two-run home run to open the scoring in the bottom of the fifth, but the Blue Wave offense struggled to drive in runs all day. Going forward, Ratchford knows what he wants his team to take away from Tuesday’s win. Meeks. The senior lefty kept the powerful Darien offense at bay. Despite giving up nine hits, the Blue Wave were only able to tally three runs off Meeks. After Danbury took the lead in the top of the sixth, first baseman Nick Gervasio put on a defensive clinic in the bottom half of the frame. The senior captain had a backhanded pick for the first out, stretched into a full split for the second and caught a popup to end the inning. It’s no secret Darien is a lacrosse town, but after winning the FCIAC last year and stringing together several successful seasons, Scott has turned Blue Wave baseball into a legitimate program at DHS. Batteries: DAN—Noah Meeks (W) and Mike Halas; DAR—Henry Williams (L), Jake Geddes (6), Jackson Vaught (7) and Cord Fox.